Also visit 2E (Twice Exceptional) Books for books unique to twice exceptional children. For Kids and Teens books, see Hot Topics! - a different kind of book list! Gifted teens have concerns, some like any other teen, and some unique to their giftedness, on topics including identity, perfectionism, relationships, stressors, and more. 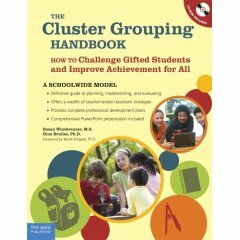 This guide offers 50 ready-to-use discussion topics and materials; it's introduction gives detailed information on how ot use the book, and how to facilitate large or small group discussions with gifted teens. I wish my teens had access to such a comprehensive discussion series! Excellence in Educating Gifted & Talented Learners by Joyce VanTassel-Baska, et. el. Are you relentlessly curious and creative, always willing to rock the boat in order to get things done... extremely energetic and focused, yet constantly switching gears... intensely sensitive, able to intuit subtly charged situations and decipher others' feelings... a truth-teller who pushes toward perfection, driven by a sense of personal mission? A humorous look inside the home of 5 very gifted children... from the mom's point of view. Prepare to have your funny bone tickled! Usborne Books are fascinating, lavishly illustrated books written with humor, drama, and tons of information. Check out these marvelous books for your gifted children ages birth to adult and beyond! Gifted kids LOVE Usborne Books!